Glade Falls. HMcS. Digital enhanced. 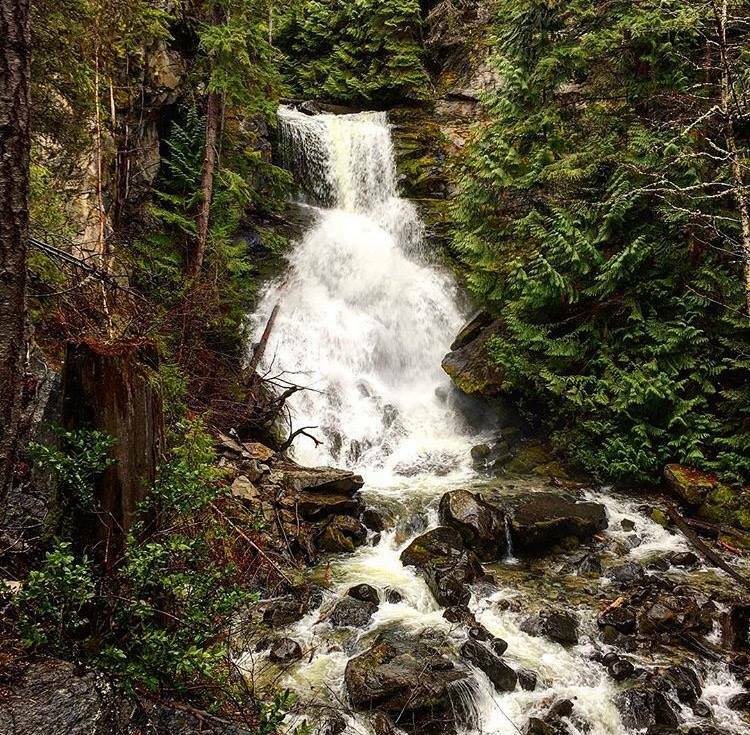 The Glade Watershed (2977 Ha/ 7350 acres/ 11.5² miles/ 29² km) consists of 2 main tributaries (the North and South Fork) that flow downwards through two sub basins into Glade Creek, creating waterfalls and then into the Kootenay River. Siwash Lake is located towards the top of the watershed and tributaries from this lake also feed into the Glade Creek. The watershed has been used by the Doukhobors since they first homesteaded here in 1911 (with a Water License from 1908), and would've been used as a water source to the Indigenous people of the area well before them. The watershed is one in recovery. It contains some old growth trees, some fire damaged areas from the 1930s, remnants of horse logging in 1927, two power lines that were installed in the 1970s and 1990s, and recently clear cut areas by ATCO Wood Products in 2000. This watershed does not need conventional industrial activity; it needs restoration so that it can continue to provide clean water for many years to come. There are almost no existing roads in our watershed, it is a small sanctuary surrounded by roads and clear cuts. 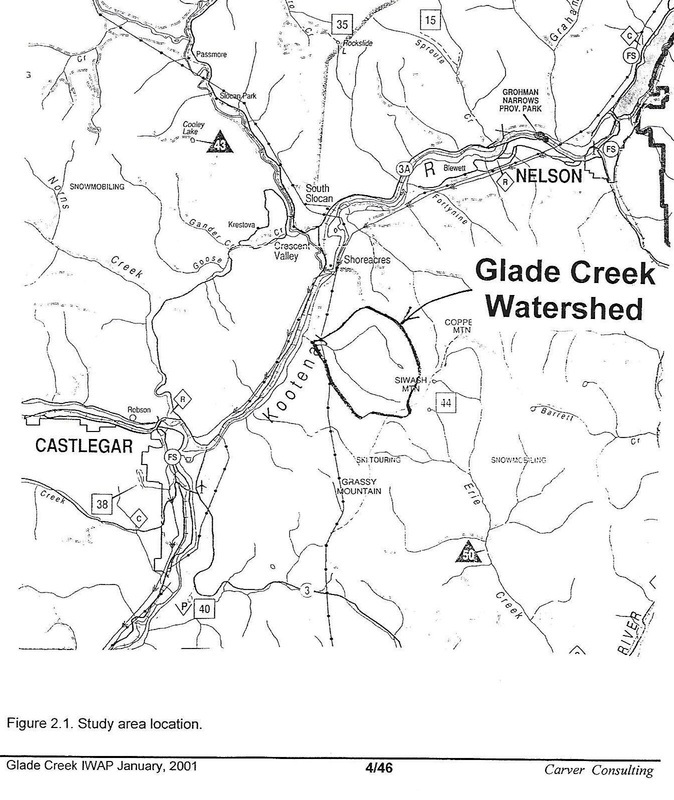 Map showing location of Glade Creek Watershed between Nelson and Castlegar: from Carver Consulting Report (Carver, Utzig, Putt 2001) "Watershed Assessment..."
The approximate boundaries of the Glade Creek Watershed shown in blue. To the North, unseen in this picture, are cut blocks. To the west, cut blocks outside the watershed are evident, as are extensive roads. To the South, Kalesnikoff plans to start logging in MacPhee Creek, coming over from the Bombi, where ATCO (South West) is planning further extensive cut blocks in Erie Creek/Granite area. 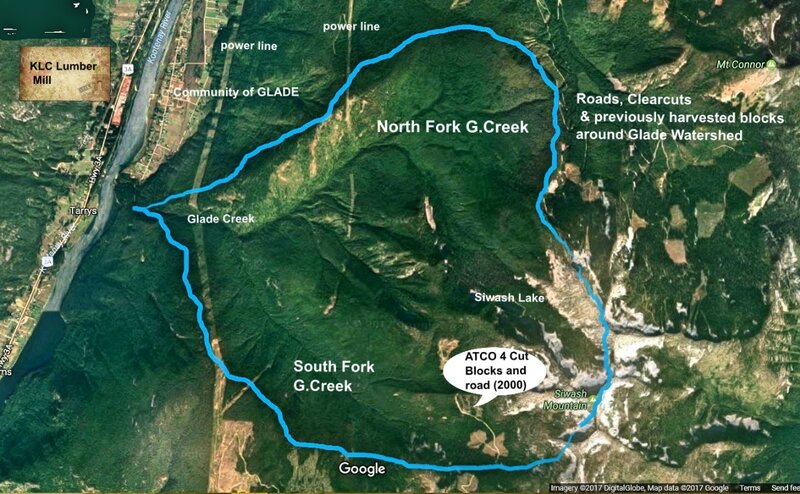 Kalesnikoff is also planned cutblocks in the South Fork area of the Glade Watershed. 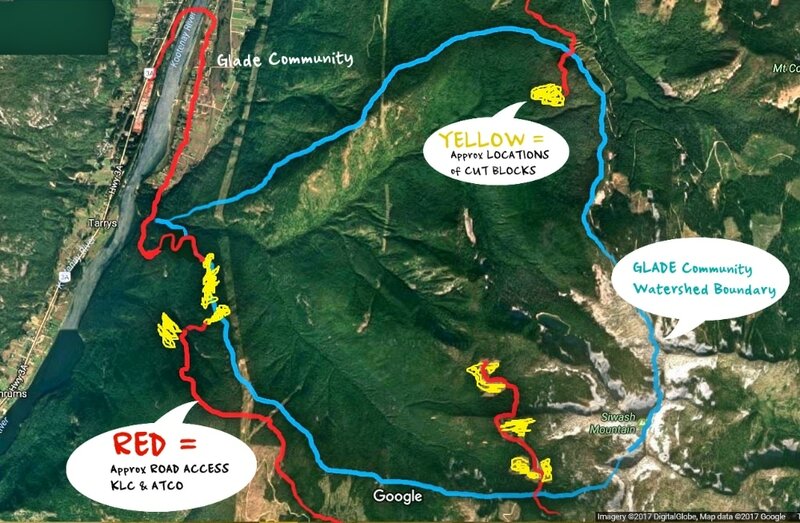 Proposed access to Glade from Road building: KLC is going to access two cut blocks on Glade face south through the community. KLC will access McPhee Creek, with 1 cut block 60% in our watershed via the Bombi. ATCO has already accessed their South west cutblocks (2001) from the Bombi, and these roads remain open. ATCO is going to access their proposed cut block R10 from Rover Creek in the North. The Glade Creek watershed is 29² km in size, orientated west-northwest flowing into the Kootenai River south of the community of Glade. The Glade Irrigation District has over 100 connections for domestic water use. This is the sole source of water for the community with an investment in the dam, chlorination and distribution system. 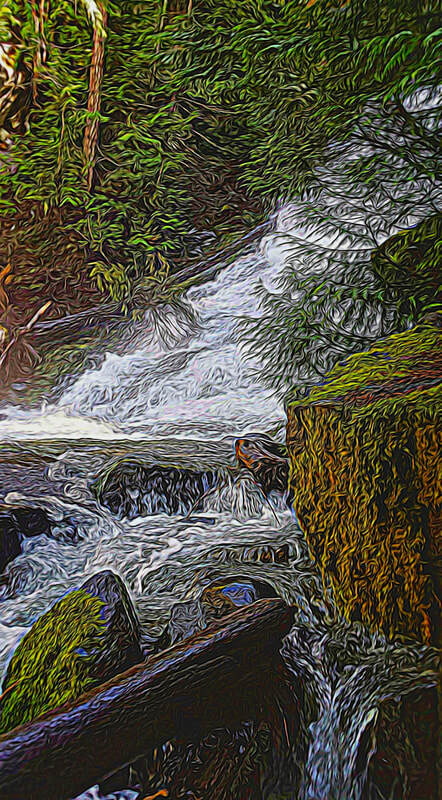 The watershed is a steep sloped high gradient basin going from an elevation of 1500' (457m) (river) to 7605' (2318m) (Siwash Mountain). This elevation difference of 6100' (1859m) in under 5 miles (8km) horizontal distance, resulting in an average loss of 1200' per mile or 23% slope drop (365m per 1.6km). The stream system drops at a rate of over 10° . The watershed is characterized by high elevation cirque basin with steep rock headwalls and shallow to nearly flat bottoms composed of meadows, wetlands, bogs and lakes, these are the high snow catchment zones that are the storage basins for the watershed. These areas control the input of water for year around use especially during the dry summer months. As the water flows out of these high zones and under the surface it is filtered by soil and the microbial activity in the organics and top soil. The areas of catchment form a narrow elevation band that is very important in the water management of the drainage. This is where springs come to the surface and become live perennial streams. This is the area that controls the flow of water to the stream system and eventually to the water supply system for the community of Glade. The microbial activity and undisturbed forest floor is very important here to the water quality and the timing of the release of water from its subsurface movement to the surface and to live streams. This zone has many small springs moving water that eventually form up with the main branches of Glade Creek. The streams are parallel and closely spaced, an indication of instability due to the lack of internal structure and water handling capability. There are two main forks to Glade Creek; the most northerly begins at Siwash Lake, the Southern branch (with 2 forks) begins with one fork at a small unnamed lake and the other fork at a wetland pond swampy area. Both branches were flowing good volumes of water when I viewed them at approximately the 6100' (1859m) elevation. These are high gradient "A2" and "A3" stream types (Rosgen typing) made up of boulders and small cobbles. The streams in the 6000' (1828m) elevation zone are stable but fragile. At present the streams are in equilibrium through the area of proposed activity. However, due to steepness, the stream bed material size and shape, and the incised nature of the stream, it would take very little impact to become unstable.